Content, Content, Everyone Screams CONTENT! Here’s your opportunity to download all the content that you will ever need and rake in the profits! As a marketer, you’ve no doubt discovered that you need a ton of high-quality content to keep your business thriving. You need content for blog posts, guest blogging, newsletters, forum posts, social media sites – and that’s just the tip of the content iceberg! You can’t do it all yourself. There are only 24 hours in a day. You could churn out buckets of content nearly every day and still not have enough. Certainly you wouldn’t have time to do anything else if all you did was write content! Hiring a ghostwriter is expensive. Have you shopped around lately? Good content is expensive. It may be worth every penny, but you just don’t have that kind of a budget right now. It’s discouraging. And it makes you feel like maybe you’re just have to settle for less content, which means growing your business slowly. “Done-For-You” content (known as PLR) is your answer! You’ve probably heard of PLR content before. But maybe you really don’t know what it is. PLR stands for ‘Private Label Rights’, sometimes referred to as ‘White Label Rights’ which basically means you get all rights to use the content as you choose. 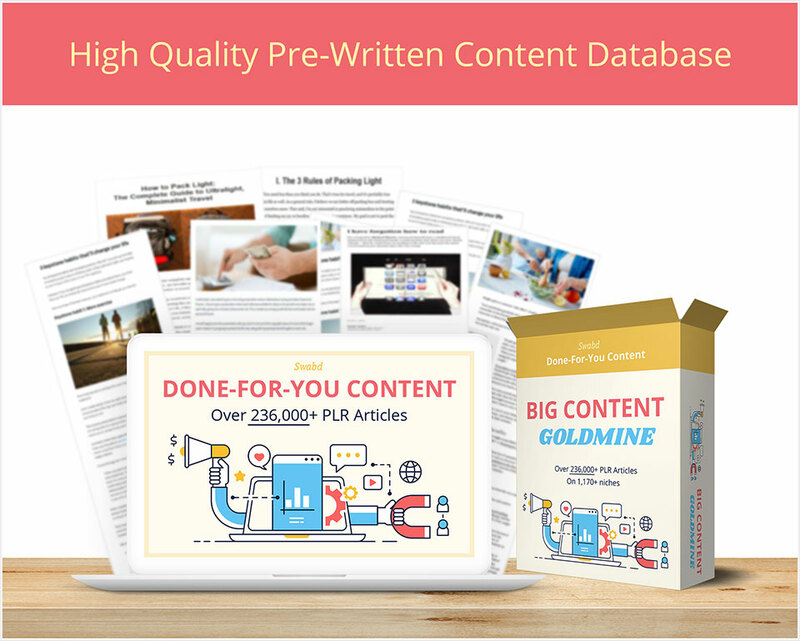 PLR content is a pre-written content that someone else has written but you are allowed to copy/paste it into your site, edit it, and publish it as your own. It’s content that a writer or marketer creates and sells to their customers. And for our purposes we’re talking about private label rights content. This could be articles, short reports, ebooks, emails, videos, audio recordings, music etc. With PLR, you can use the content as your own and post it online on your website, blog as if you wrote it yourself. You’re free to edit or change the content if you like. You can even add your own thoughts and opinions if you want to. In fact, you really should personalize the content to stand out from the crowd. We love it when you add your own thoughts, ideas, perspective, and experience into the articles. It’s a great starting point to create your own unique content or even fill in the gaps in your existing or new content. You can modify the PLR content, give it away or resell it as long as you stay with the terms of the license. The problem with content creation is that most business owners don’t have time or skills to write content… They simply hate the process of writing them. Creating an expertly researched, professionally written ‘content’ is not easy. You don’t have to write content yourself, we’ve already done it for you! Now you too can grow your reach, build loyal customers and stop worrying about constant content creation. You too can get high-quality content at “Blow Your Mind” prices! Simple: You just purchase this high-quality package of over 236,000+ PLR articles! You see, using PLR content SAVES YOU TIME. Either you use it as-is (no work required!) or you spend just a minute or two tweaking each article. Either way, in minutes you’ll own the rights to use 1,000’s of high quality content. You can even put your name as the author! The other big benefit is that it SAVES YOU MONEY. If you hired a ghostwriter to create these content, you’d pay at thousands of $$$. But claim your PLR license today and you get the same high-quality articles at just a fraction of the price! Access to collection of 236,000+ high quality done-for-you content with private label rights. Just take a look at some of the topics in this MASSIVE Pack of private label rights content. What Can You Do With Done-For-You PLR Content To Grow Your Business? You may edit the content included inside the database. You can add more information, extract information, combine it with other information and create your own original infoproducts to sell. Extract articles, create rebrandable reports, blog posts, autoresponder mailings and so much more. Another idea is to record yourself (or hire a professional) reading the content and create your own .mp3 audio products to sell online as a premium product. Or, create your own physical products. The content in this package is full of useful information. Any of it would be a valued asset in a marketing or business membership site. You can have years of content ready to add week after week. Incorporate these materials as part of a coaching program or e-class as handouts or supplements, or use them as the backbone of the information you share in your ecoaching program. Make a few “assignments” based around these, and you’d have a high-ticket offer in place. 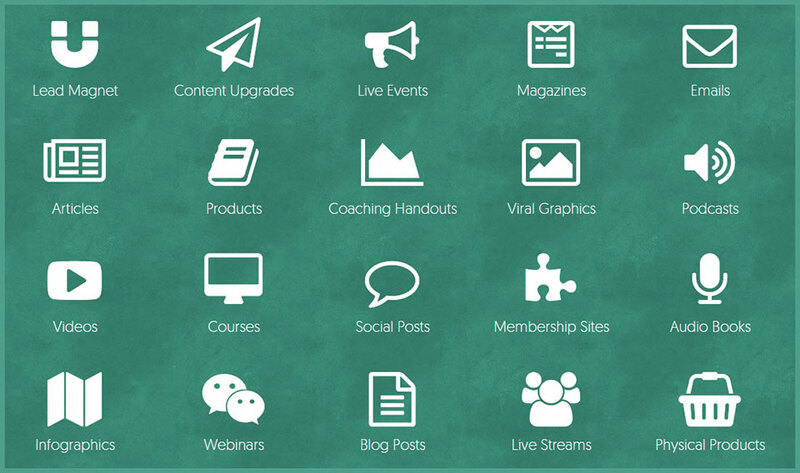 Use the content in this package as a starting point for a webinar or teleseminar. This would include both free calls to use as lead generators to sell other offers, or as featured paid events to generate revenue. Contact your local Chamber of Commerce. Put together a seminar and teach marketing tactics, using these documents as your training materials. Charge $100 or more per seat and host a seminar each month. Edit these for any industry you’re in. Customize them for your readers. There is a lot of information here that can be custom-tailored to non-marketing communities for fresh offers. I absolutely loved the Big Content Goldmine package! They have the most complete and well written PLR articles you will ever find on the internet. Using the content available on the package I was able to develop new content for my new website. This product has been my go to source for quality content on several sites. It works together with other products giving you the best results possible. I strongly recommend this package to writers, bloggers, and everyone else who need quality content. I recently started into affiliate marketing and Big Content Goldmine have become my secret weapon. I was struggling to create quality content for my websites before but the game has now been changed. This content package has an unbelievable article database with thousands of high quality pre-written content that I quickly use to manually re-write or simply spin them and post to my affiliate websites. You can use these content with any spinning software and save a lot of article creation time. It simply couldn’t get any better than this. Thanks for creating such a great package. I’ve been into online marketing space for some years now and still struggle to create content. It is very expensive to outsource content creation and writing them on my own takes too much of my time. But now with Big Content Goldmine, I’ve access to enormous list of quality content that I need. It’s simply overwhelming and comforting at the same time knowing that I no longer need to worry about how to and what to write for my blogs anymore. I cannot recommend Big Content Goldmine highly enough. I just love Big Content Goldmine! I was really surprised to find thousands of content on my niche. It really helped me grow my blogs and articles and more. This is a must have product for every marketer out there. Highly Recommended!! I truly love Big Content Goldmine! It has helped me to generate new ideas for articles and other content for my new website. I was really surprised with not only the volume of available content in my specialized niche but also with the quality of the content as well. I am very happy that I found this product. I highly recommend Big Content Goldmine! It saves you time and money. This is a must have ‘premium’ training manual if you want to learn how to effectively use PLR content and dominate your niche. Once you know how to use PLR content, you’ll be able to churn out good, quality content faster and for less cost than your competitors. And that means you can drive in traffic fast, build bigger list and make more money! How to take the “least of all PLR” and turn it into a promotional machine that advertises your business for you at absolutely no cost. You’ll learn easy methods for taking stock PLR articles (I’m guessing you have dozens and maybe even hundreds of them on your computer — you can buy them for as little as a nickel apiece! ), rewriting them and then setting them in motion through dozens of DIFFERENT KINDS of distribution channels. 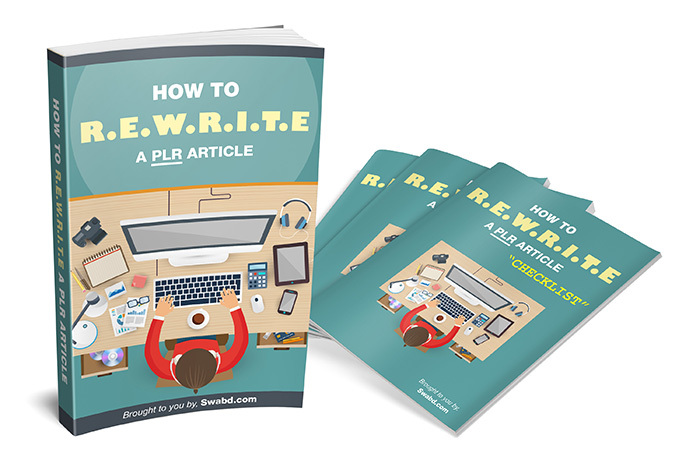 A simple 7-step plan for rewriting PLR articles to make them your own original content. Dozens of PLR rewrite examples literally *showing* you a myriad of ways to tweak PLR content to make it truly yours. More than 2 dozen different ways to put those articles to work bringing you traffic, subscribers and sales. Surprisingly easy methods of breathing new life into tired and lame “junk” PLR content … learn to salvage that useless content that you spent money on and actually profit from it. It comes with a downloadable PDF file, professionally designed visual process maps, accessory checklists and worksheets and extra enhancement supplemental materials. Don’t Miss This INCREDIBLE Opportunity Because Every Smart Business Builder Needs A Content! As a ‘Big Content Goldmine’ customer, you’ll be among the elite in marketing who can effortlessly create content and attract hungry and loyal customers. Act now and eliminate all the hard work and expensive costs of creating your own content! Order now, and you have a full 30 days to use these articles in whatever way you’d like. If you’re not absolutely thrilled, just email us for a prompt and cheerful refund – no questions asked! I’m sold! What’s it gonna cost me? Only limited package will be sold. License Terms: What You Can & Can’t Do With These Content? Important: You are not allowed to create a PLR product that competes with Big Content Goldmine.